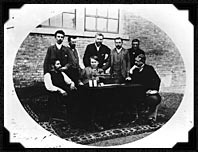 The spirit of Menlo Park was sometimes recaptured at the West Orange laboratory, as when Edison worked with this small group to improve the phonograph in 1888. 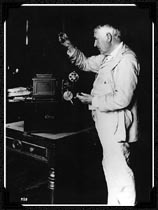 Edison did not retrain himself for new technologies. He avoided almost entirely the area of electronics. He ignored a new discovery - radio waves. He did not investigate alternating-current systems. 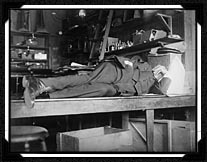 In his new laboratory he pushed forward in familiar areas or explored new subjects that did not require radically new techniques. 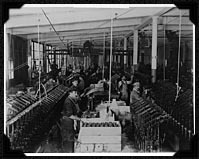 He improved the phonograph, invented a way of producing motion pictures, devised a method of separating iron ore magnetically, built concrete homes, tried to develop a storage battery for automobiles, and searched for a source of rubber. Some of his ventures were successful; others, like iron-ore separation, were spectacular failures. 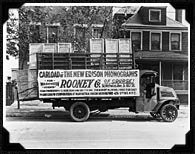 Manufacturing phonographs and phonograph records was one of Edison's most profitable ventures, about 1920.